gathered to raise over $101,000 in support of MEF’s student programming. Alum Giovanna shared, "Metro inspires girls who don’t see themselves represented anywhere else, girls who often don’t think they are worthy of succeeding. Metro teaches us we can do anything we put our mind to. This is why the city of Chicago needs a place like Metro. This is why I needed Metro." The former director of ticket sales for the Cubs shares wisdom with Midtown 8th grade students. Students participating in the summer business apprenticeship at Metro were treated to an amazing learning experiece at Potbelly’s corporate office in Chicago. Employees teamed up to provide an in-depth look into the many facets of Potbelly’s unique corporate culture. Law teams from Discover Financial and Burr Forman visited the Midtown Law Apprenticeship for a full day of career and educational advice, an overview of the American justice process and a mock oral argument of an actual United States Supreme Court case. MEF Board Member and former General Counsel to the National Security Council under President George W. Bush gave a riveting presentation on his experiences in the White House at the latest MEF Breakfast. Candace Vogler leads a team of philosophers at the University of Chicago who are studying: "Virtue, Happiness and the Meaning of Life. She recently shared some of her observations about human nature and happiness at MEF's Breakfast with Champions speaker series. Oh the Places They've Gone, The People They've Met! This summer, MEF students heard from 81 professional career speakers, went on 5 service trips, took 32 behind the scenes tours at Chicago corporations and enjoyed fun & educational field trips at 21 of Chicago's cultural institutions!! After an afternoon with 7 attorneys from Discover Financial Services and 2 partners from Burr & Forman, the Midtown Law Apprentice students have a deep appreciation for the law and the grit, determination and preparation it takes to argue cases in front of the bench. 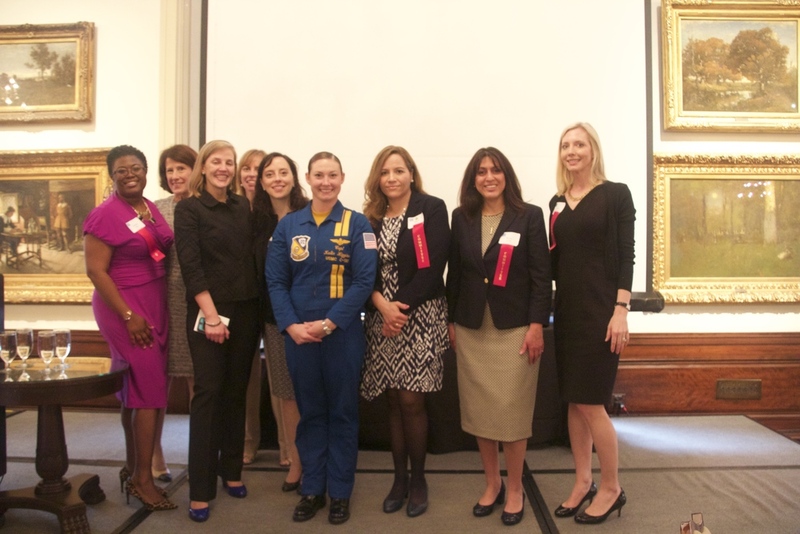 Captain Katy Higgins, the first-ever female Blue Angels pilot, spoke to the Metro Achievement Center’s 4th-12th grade students and at the 19th Annual MAC Luncheon this week. She dazzled both crowds with her tale of perseverance and overcoming the odds to make history. Higgins, a third generation pilot (both grandfathers flew planes in World War II and her father was a pilot as well), spoke of the importance of a life of service. Higgins grew up knowing she wanted to serve people somehow, and after considering being a police officer, firefighter and a nun, chose to follow in the footsteps of her relatives. Capt. Higgins speaking to Metro students and families about building up their power, and using resources at Metro to seize opportunities. Higgins grew up in Maryland and was the valedictorian of her high school class. She then attended the U.S. Naval Academy, Annapolis, MD, where she graduated with a degree in Political Science. She followed this degree with a Masters of Arts in International Security from Georgetown. For her military service, Higgins trained to fly C-130s, the military’s cargo plane, and deployed on a combat mission to Afghanistan and a humanitarian mission in Sudan. Of all of her accomplishments, Higgins said her greatest accomplishment to date was saving the lives of fellow U.S. soldiers who were under attack in Afghanistan. Months later, she met one of the men whose life she had saved, and he personally thanked her. That experience alone let her know that the life of service she had chosen was worth her sacrifice. After her second deployment, and against all odds, Higgins then began the arduous journey of applying and training to become a Blue Angel. Despite many people discouraging her efforts, Higgins forged ahead, relying on the power she gained from all of her previous experiences to endure the program and ultimately, become the first-ever female Blue Angel. Higgins encouraged the girls to find their inner “Warrior Queen” to overcome the negativity around them. She described Warrior Queens as having two sides, a side that is loving and nurturing, and a side that is courageous enough to change the world. She then quoted her favorite queen, Beyonce: “Power isn’t given to you, you have to take it.” She defined power today as seizing opportunities, preparing, and doing the right things to build oneself up. After her speech, Metro girls of all ages glowed with excitement as they asked for pictures, autographs and advice from Higgins and her Blue Angel cohorts. Higgins equally wowed the audience at the 19th Annual MAC Luncheon. Beyond her own history, Higgins paid homage to previous groundbreaking women in the military who paved the way for her (including Pvt. Opha Mae Johnson, who joined the Marine Corps in 1918, two years before women were allowed to vote). Higgins went on to praise the work at both Midtown and Metro, stating that Metro is building a generation of women prepared to fight for equal wages and better opportunities, and that Midtown is building a generation of young men who are compassionate, respectful toward women, and open to equality for all. After the whirlwind of two presentations in two days, Higgins told MEF’s Executive Director Glenn Wilke that she felt she gained more from her Metro visit than anyone, echoing the sentiments of so many MEF volunteers and supporters: that the spirit of service is the ultimate gift. ABC7 interviews Captain Katie Higgins, the first female Blue Angels pilot at the 19th Annual Metro Advancement Council Luncheon benefiting Chicago's at-risk urban youth. Andy Cunningham's "Adventures in Wonderland"
Former Steve Jobs PR manager and marketing guru, Andy Cunningham, dazzled a packed house at 1871 with life lessons and her bright vision for the future. David Elliot, attorney at law at Burr & Forman and a group of attorneys from Discover visited the Midtown Center to meet with the Law Apprenticeship students and implement a mock trial. Mr. Dan Jorndt shared some "Jorndt Jolts" of advice with Metro's summer Business, Engineering and Hospitality Apprentices. Midtown student Danny Sanchez interviews Andy Clark for a story in the Midtown Voice newspaper. Ruby Bridges shared her very personal story with 350 guests attending the 15th Annual Metro Advancement Council Luncheon at the Union League Club of Chicago on May 14. After four Rock the Street, Wall Street sessions of budgeting, trading, and the basics of finance, the students were invited to tour tastytrade in downtown Chicago. Bill Jacobs, owner of Piece Pizzeria & Brewery in Bucktown, visited Midtown to share his 32-year history of perseverance, success, teamwork and passion in the Chicago restaurant industry with the high school program.